Home / PC game manuals / Fallout 3 :. Fallout 3 manual Just click to open it in a new window then print the manual. 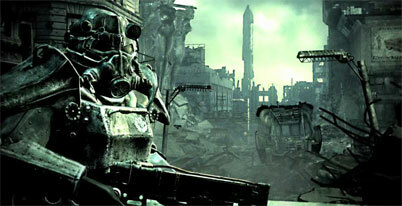 Fallout is a franchise whose success with the RPG community has been most impressive. During the first two episodes that were followed to a lean year interval, we decided, we fans, the result would be the most important event of our virtual lives. Indeed prisoner as a good shelter, like any hero Aroyo, the post-apocalyptic world that stretched before us we were afraid but we intriguing without power immersive and memorable dimension addictive. Ten years later we have grown slightly and then comes the long awaited announcement, the moment we have all been waiting in the shadows of these pseudo suites as Fallout Tactics and Brotherhood of Steel, this time making the story or fiery we get the first taste of radiation, the taste of a new world, drab and beautiful, dangerous and likely. Prepare yourself to leave your lair to buy an app that will go once more in the winter and probably the next to come to the exit of the fourth album, the new holy grail.